RecipeTips.com's video demonstration, 'How to Carve a Rack of Lamb,' has easy-to-follow instructions to carve a rack of lamb. Hi! This is Laurie from RecipeTips.com, and today, we are going to be carving a rack of lamb. To begin carving your rack of lamb, that is presented as a guard of honor, start by snipping these kitchen twines that you wrapped the racks together with. Just use a knife or kitchen scissors and go underneath the twine and make a small cut through there. Go all the way down the rack and just unwrap it from the rack of lamb. When you are slicing a guard of honor, you can serve it as a single serving where you slice through one side, one rack, and serve it that way and I will demonstrate. Or, you can carve two single rib portions at one time by going in between the two rib bones and slicing all the way through. Make sure you hang on to it so it stays together with your fork. 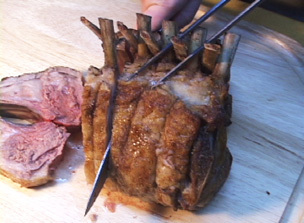 For more information on carving lamb and other meats, visit RecipeTips.com.